Recently, I was teaching a student in an on-course playing lesson behind a foursome of middle aged gentlemen. It seemed like every hole at least one of their shots ended up in a greenside bunker and they all had tremendous trouble executing their shot or at the least getting out of the trap period. My student turned to me and said “those guys look like great players until they are in the sand, why is that?” I will answer that question by giving you a good idea of what to practice and how often you should practice your bunker play, also touching on some important pre-shot feelings when in the sand. Now let’s be honest!! 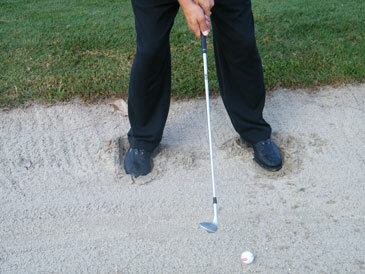 How often do you practice your bunker play? How much time do you spend if you do practice bunker shots? And what shots do you practice? 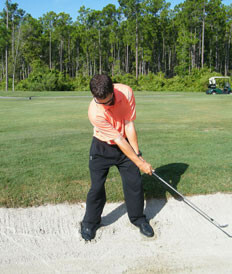 I believe that you should practice bunker play enough to be comfortable and confident when are in the sand. Therefore, a good long practice in the bunker for a day, along with maintaining good feel by practicing on a regular basis would get you started on the right track. Also, give yourself different lies in the sand and hit to different targets or landing areas to improve your adaptability and accuracy. While practicing in the bunker, here are some key feelings to get out successfully and stick it close to the flag. I have three keys that I always try to feel in the bunker. First, I make sure that I have a solid base that supports a good turn and solid balance. Notice how I slightly dug my feet into the sand and gripped down on the club, and my weight is distributed more on my left foot. spine should feel like it is tilted a little past perpendicular to the slope of the lie. Finally, I try to “release” the club through the downswing. The club head should feel like its beating your hands to the ball and released past your chest while maintaining your chest over the ball. This feeling can be rehearsed in your pre-shot routine, just remember not to ground your club. With these simple feelings and a more dedicated practice routine, you are on your way to being the best bunker player in your weekend foursome or even at your club. 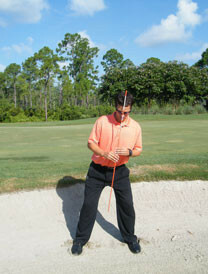 Becoming more comfortable and confident in the sand will change your perception of how you are going to attack the pin. You will be able to focus on your target instead of worried about going back to the beach.